Is the Gang of Eight Plan "Amnesty"? The "Gang of Eight" senators argue that their bill (S.744) is not an amnesty because illegal immigrants would have to pay a fine and fulfill other requirements as a condition of legalization. Yet seven recent tax and parking-ticket amnesties imposed conditions and payments on those who violated the law, and in every case these programs were considered to be amnesties by elected officials, the public, and the media. Like the Schumer-Rubio immigration bill, each of the amnesties discussed below set aside the normal penalty, but still required payment. In 2012 Rhode Island offered what the state government and multiple media outlets, including Boston.com and WPRI Radio explicitly called a "tax amnesty". The state even created the website www.TaxAmnesty.ri.gov to promote it. The amnesty allowed certain taxpayers to pay overdue taxes plus 75 percent of interest due by November 15. The remaining interest and civil and criminal penalties were waived. The town of Huntington, N.Y., just completed a parking ticket program described as an amnesty by the town board, the town supervisor, and local media. To qualify for the amnesty, past due tickets issued January 1, 2005, or later had to be paid by April 30, 2013. The person had to pay the ticket value plus any penalties, but could do so at a 40 percent discount. In 2009 Louisiana ran what the state itself called a "tax amnesty", even setting up a "Tax Amnesty Web Site". The media also referred to it as an amnesty (see here and here). The program covered past due taxes from 2001 or later. If taxes owed and 50 percent of interest were paid during the two-month amnesty period, the remainder of the interest plus civil penalties were waived. The city of Houston recently completed an amnesty for traffic and non-traffic citations. The media called the program an amnesty (see here, here, and here). The city's 2013 "Amnesty F.A.Q." described the program as requiring payment of tickets plus penalties, but allowed discounts based on "amnesty rates". Court officials explained that those who took advantage of the amnesty would not be "subject to arrest during any upcoming warrant sweeps". A recent District of Columbia parking ticket program — labeled an amnesty by the mayor, the Washington Post, WTOP news radio, and others — required those with overdue tickets to pay them, but the normal late fees and penalties were waived if a ticket was issued prior to January 2010 and paid by April 12, 2013. 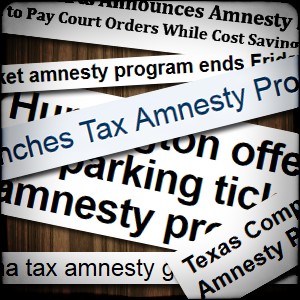 Texas ran what it called a "Fresh Start tax amnesty" from June to August 2012. If businesses paid past due state taxes plus any fees they owed by August 17, interest and penalties were waived. The program did not include fees owed to the Public Utility Commission. The state comptroller and the media, including the Houston Business Journal and the National Law Review, described the program as an amnesty. Ohio is currently running a program that the state itself, local media, and accounting firms have all described as a "tax amnesty", for its consumer use tax. If taxes owed since 2009 are paid by May 1, 2013, penalties and interest will not be charged. Members of the Senate's Gang of Eight have argued that S.744 is not an amnesty. On his web site promoting S.744, Sen. Marco Rubio (R-Fla.) states that, "No one gets amnesty." He argues that because the beneficiaries have to meet requirements and pay fines it is not an amnesty. He even states, "no undocumented immigrant is rewarded with anything." Similarly, Sen. Jeff Flake (R-Ariz.) argued in a National Review Online opinion article, that "This bill ensures that no illegal immigrant will be given amnesty or rewarded for illegal behavior." When asked if the bill was amnesty in a recent interview Sen. Charles Schumer (D-N.Y.) stated "not at all." Sen. John McCain (R-Ariz.) also claimed in a recent interview that the bill is not amnesty. Despite claims to the contrary, S.744 is similar to the tax and parking ticket amnesties discussed above. The normal penalty for being in the United States illegally is that the alien must leave the country. Under S.744 this penalty is set aside and illegal immigrants who arrived prior to January 1, 2012, are given legal status and can remain in the country. They must also pay a fee of $500 initially, and undergo a background check. Like all the amnesties discussed above, S.744 has conditions and payments. If S.744 is not an amnesty, then none of the tax and parking ticket amnesties discussed above are amnesties, even though everyone involved with them considers the programs to be amnesties. The Schumer-Rubio immigration bill is an amnesty, and those who claim otherwise are not being honest with the American people.